Is the second season of the Ellen’s Game of Games TV show on NBC still a good time? As we all know, the Nielsen ratings typically play a big role in determining whether a TV show like Ellen’s Game of Games is cancelled or renewed for season three. Unfortunately, most of us do not live in Nielsen households. Because many viewers feel frustration when their viewing habits and opinions aren’t considered, we’d like to offer you the chance to rate all of the Ellen’s Game of Games season two episodes here. An NBC game show, Ellen’s Game of Games is hosted by Ellen DeGeneres and features games from her daytime talk show, The Ellen DeGeneres Show. Audience members compete for a potential four rounds and the chance to win cash prizes. They try their hands at “Blindfolded Musical Chairs,” “Dizzy Dash,” and “Scary Go Round,” as well as other contests. To advance to play “Know or Go,” a player must win in a given round. The one who makes it all the way to the final round ultimately gets the chance to play “Hot Hands,” in which they have to supply correct answers to questions in a set amount of time. What do you think? Which season two episodes of the Ellen’s Game of Games TV series do you rate as wonderful, terrible, or somewhere between? Should NBC cancel or renew Ellen’s Game of Games for a third season? Don’t forget to vote, and share your thoughts, below. 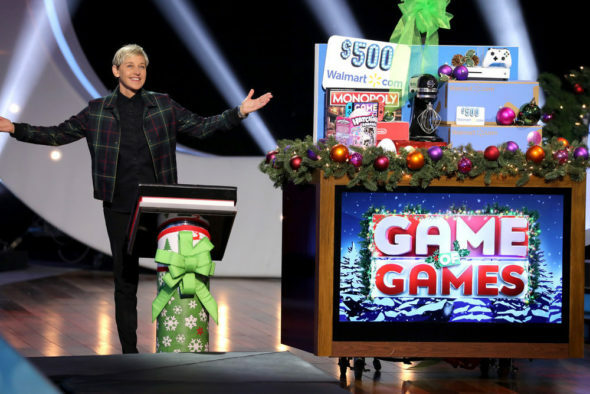 *1/16/19 update: NBC has renewed Ellen’s Game of Games for a third season. More about: Ellen's Game of Games, Ellen's Game of Games: canceled or renewed? Ellen’s Game of Games on NBC: Cancelled or Renewed for Season Three? Ellen’s Game of Games: Is the NBC TV Show Cancelled or Renewed for Season Two?